Weekly Discount - Save $10 ! On going.... Available when you stay 7 or more nights. Discount applies any night of the week. 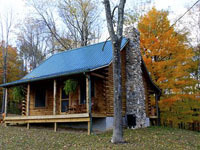 "Stay 7 consecutive days or more and receive $10 off each night excluding Fri/Sat "
Crooked Mile is a real log cabin surrounded by 150 acres of woods.We allow children,but the twin beds are in a loft area,so check the pictures on the web page to see if appropriate for younger children. There is a pond on site but swimming is not allowed.